There are three pedals on the piano: the damper pedal on the right, played with the right foot; the soft pedal on the left, played with the left foot; and the sostenuto pedal in the middle, played with the left foot. In all cases, the end of the pedal should contact the ball of the foot in line with the big toe. The heel of the foot stays on the floor at all times, and the foot remains touching the pedal at all times. When a key is depressed, the corresponding damper is raised off the strings simultaneously, allowing the strings to vibrate. When the key is released, the damper returns to its resting place against the strings and “damps” the vibrations, stopping the sound. When the damper pedal is depressed, all the dampers at once lift from the strings, and return when the pedal is released. This simple situation has complex ramifications. When a note is struck on the piano while the damper pedal is down, the vibrations from the strings of that note cause other strings to vibrate as well. These new vibrations are called sympathetic vibrations, and will mostly be pitches from the overtone series of the principal note. Since the resonance of the entire instrument is called into play, the chief effect of the damper pedal is a change in the sound quality of the piano. Therefore, the primary use of the damper pedal is to manipulate the sound quality. Basically, the quality of sound with the pedal in use is a fuller, more fluid resonance than without the pedal, which is a dryer, flatter kind of sound. This difference is easily heard. To lift and then to depress the pedal, starting from the down position, is to change the pedal. It is unnecessary to raise and lower the pedal completely every time you change it. On most pianos, the pedal can be lowered nearly an inch before it connects to the damping mechanism. Don’t waste time and effort moving the pedal through this empty space. It has no effect on the sound. If necessary, experiment, slowly repeating a staccato note as you lower the pedal by fractions of an inch until it starts to catch the sound. This is the level from where you begin each descent of the pedal and to where you allow it to return. The timing of the pedal changes can vary, with varying results. Most of the time, the pedal is changed immediately following the striking of a note. This produces a smooth transition from one sound to the next and eliminates blurring of sounds. When the pedal is depressed before the note is struck, all strings are available to resonate, and the sound will have all of its richness from the beginning. This is especially important to remember on the first chord of a piece or whenever the music continues after a rest. The pedal can be depressed exactly at the same time as the note is struck. Usually, the pedal and note will be released simultaneously as well when this technique is used: the hand and foot coordinate their down-up movements. This creates an accent on the pedaled note by adding a richness of sound to it while its neighbors remain “dry”. When the pedal is depressed relatively late after the note is struck, there is a noticeable change in the sound quality in the middle of its duration. This is rarely desirable and creates an odd effect that passes unnoticed by many students. It is particularly apparent on the first chord of a piece or whenever the music continues after a rest. However, this effect can be put to good use when one wants to give the illusion of a crescendo on a held note. The pedal can be applied lightly and flexibly during pieces in a fast tempo or during runs and passagework. Characterized by frequent and irregular changes, this type of pedaling is called surface pedal. This gives substance to the tone without blurring the sounds. Between the level where the pedal first engages the damping mechanism and the lowest position of the pedal are any number of subtle degrees. These are collectively referred to as half pedal. Familiarize yourself with half pedal effects through experimentation. Generally, the pedal should be changed as often as necessary to sustain clarity when harmonies change and during fast-moving melodies. However, in works where a lustrous sound quality is desirable throughout, this last consideration is modified by the following situation: in a succession of notes played with the pedal down, the ear follows the most recently played note if all the notes have been played at the same dynamic level or with a crescendo. If there has been a diminuendo, we still hear the first, or loudest, note that was played. Therefore, one can pedal through a succession of different pitches while treating the dynamics carefully. While it is held down, the pedal accumulates sound with each additional note struck. This property can be used to create or enhance a crescendo, particularly in a context of fast note values where little pedal is being used. Conversely, by lifting the pedal slowly, there is a gradual decrease in the sound, which creates a diminuendo. Thus, without the involvement of the arms, hands, or fingers, the pedal can be used to produce dynamic changes effortlessly. Please notice that a pedal change creates an articulation in the sound texture. With the pedal down, the sound accumulates. The pedal change cancels that accumulation and causes a break. An easy demonstration of this is to hold down a chord and then change the pedal several times in a row. In practice, this property can be used to subtly create or reinforce an accent; or to emphasize a structural division such as the strong beats of a measure or the beginning of an independent phrase. When a note or chord is repeated at a slow to moderate tempo, the choice must be made of whether or not to change pedal on each repetition. Changing will be cleaner and more pleasing generally, unless the desired effect is the accumulation of sound. Because the larger bass strings have larger vibrations than the other strings in the piano, an extremely rapid pedal change may fail to completely damp them. Thus it is possible to change the pedal in such a way that clears the sound in the upper registers while permitting the bass notes to continue. There is one use of the pedal which is desirable only as a last resort. When it is awkward or impossible to connect notes using a legato touch, it is necessary to make the connection by sustaining the sound with the pedal. Unfortunately, many students make this the main function of the damper pedal and never develop legato playing. Please remember that the primary use of the pedal is to manipulate sound quality. Legato is controlled with your fingers, not your feet. Throughout the major upper section of the keyboard range, each note has three strings; in the lower range each has two, while the lowest notes have only one. 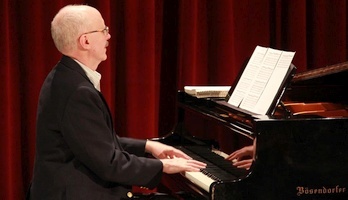 On a grand piano, the soft pedal shifts the entire action slightly to one side so that the hammers strike one less string per note (or, in the lower bass range, the hammers strike off-center). This creates a sound which is more muted and less vibrant than without the soft pedal. Therefore, the primary use of the soft pedal is to manipulate sound quality. It is employed to create an atmosphere of mystery, other-worldliness, distance, inwardness, fantasy, et cetera. Unusual effects can be achieved by depressing the soft pedal to various intermediate degrees instead of all the way down. However, these are very subtle, specialized, and rare. There is another use of the soft pedal which is desirable only as a last resort. Since the soft pedal produces a slight reduction in volume, many students make this the main function of the soft pedal and never develop the ability to play softly without it. A pianist can play perfectly loudly with the soft pedal down. Please remember that the primary use of the soft pedal is to manipulate sound quality. Dynamics are controlled with your arms, hands, and fingers, not your feet. The sostenuto pedal acts as a selective damper pedal by sustaining specifically chosen notes. To use it, play and hold down a note or chord. Then depress the sostenuto pedal. After releasing the keys, those notes will continue to sound until the sostenuto pedal is released. The damper pedal can be changed while the sostenuto pedal is down without affecting the notes held by the sostenuto pedal. This pedal is ordinarily used in organ-like textures to sustain long bass notes below changing harmonies (“pedal point”).